What’s the best investment an ordinary working Canadian can make? The next hot tech stock? The surprising answer is: none of the above. 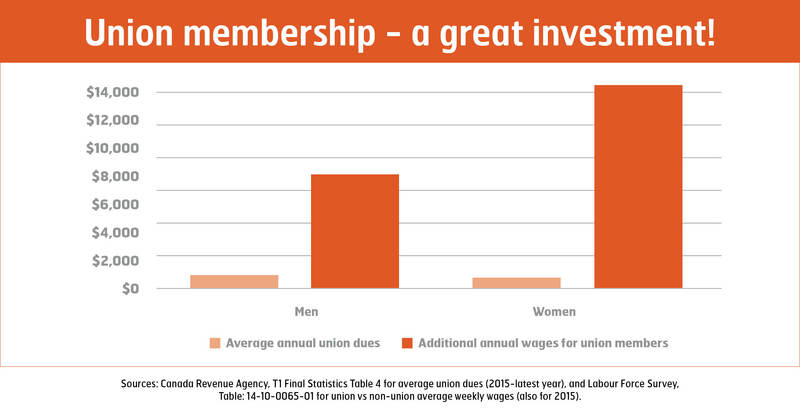 By far the best investment most working Canadians can make is to join a union. Let’s have a closer look. Union members in Canada are paid, on average, an extra $5.26 an hour, $180 more weekly, and over $9,000 more per year than non-unionized workers. This union wage premium is about 20 per cent higher than non-unionized wages. When adjusted for age, gender, education, industry and other characteristics, the union wage premium is estimated to be lower, but still amounts to five to 20 per cent more than non-union workers. It is considerably higher for younger workers and generally greater for women and lower paid workers, thanks to unions’ fight for equality at the bargaining table and in the courts. Also, union members benefit from much better access to pensions, supplementary health benefits, paid leave, and better job security than non-union workers. A vast majority of union workers have access to superior defined benefit pension plans and better access to all other forms of benefits than non-union workers. The total additional value of these benefits often exceeds the union wage premium, boosting the total union wage and benefits premium. The additional wages and benefits workers gain from union membership make for an exceptional return on investment: annual union dues in Canada average 1.6 per cent of workers’ wages, less than $800 annually. This means the actual return on union dues, the direct benefits of workers collectively bargaining and acting in solidarity with each other, provides an average payback of at least five to one, and a minimum return of 400 per cent annually, and usually much more than that. That’s a far better return than investments in real estate, mutual funds, the stock market or high-tech, and one that provides less risk and greater security.